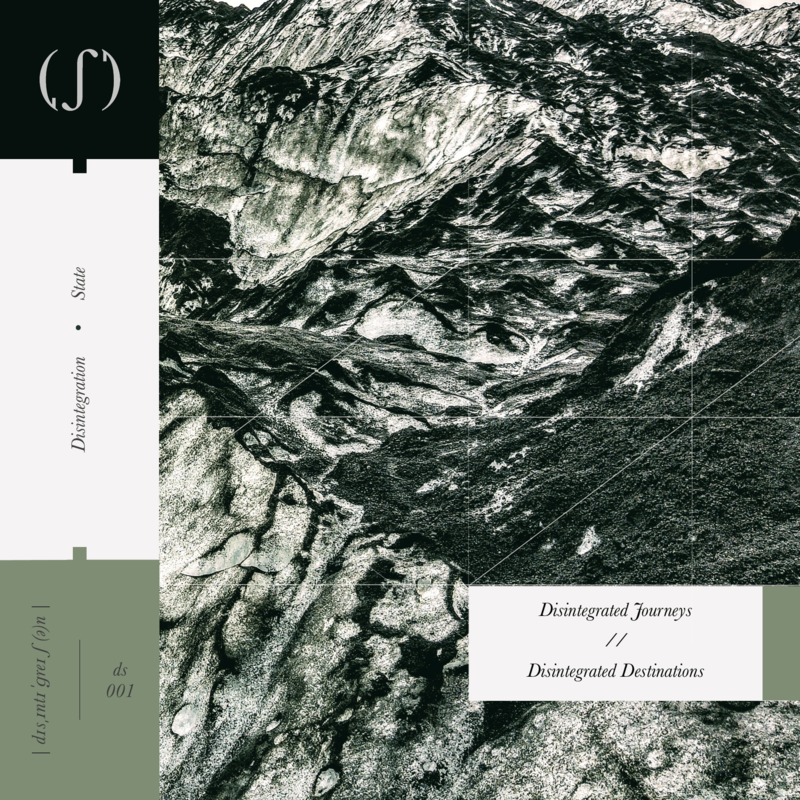 Disintegration State is one of the most exciting new electronic labels around. Just six months into their existence, they’re putting on a night at the Peer Hat in Manchester on Saturday 16 February. Andy Vine caught up with label heads Steve Hadfield and Kris Ilic who releases music as Lowering. You’ve both been making music for a while, tell me about how you got into it. KI: I played bass and a little bit of guitar in a post/math-rock band called Part Rocket for a number of years. It was a revolving line-up based around myself and the drummer Gareth (Thomas, guitarist for USA Nails). I also played in a band called The Robot Blues, around the same time. We split when our lovely singer Pete Stevens sadly passed away from cancer. I didn’t really stop making music, but it took about eight years or so until I shared anything publicly. Doing things myself always seemed pretty intimidating. SH: I had a half-decent keyboard you could record multi-part projects to when I was a kid. That was really naff trance. I wanted to be the next Chicane or Robert Miles. My first ‘proper’ composing was when I picked up FL Studio at the end of university. I must have made close to 100 tracks of drone, IDM and ambient after a couple of years of varying degrees of quality, but then I fell out of it for six or seven years. I just lost all impetus to create things. When we got our first house with this lovely attic space I suddenly felt the urge again at the start of 2018. My first three releases were just refining the best of those 100 tracks. You’d both self released on Bandcamp before you set up the label, why did you decide to release your own stuff? KI: All of it stems from the Drowned in Sound forums for me. The first thing I took seriously was Post-Truth Politics. That was written and recorded in 2016, in the week post-Brexit vote result. I remember just being utterly unable to tear myself away from the rolling news feeling this combination of shock and despair at what was unfolding. I had my guitar in my hand a lot for some reason and was just recording lots of guitar loops and drones whilst the news unfolded, and the music kind of took on a life of its own. I didn’t know how to express what I was feeling verbally or in writing, but that record captured something for me, and it felt important to say it. I put it on the DiS ambient thread and to my surprise, people really seemed to engage with it. SH: I suppose I’d been inspired by folks on Drowned in Sound who were self-releasing incredible records. Body in the Thames, Colin Mawson, Dawnwalker, and of course Lowering. I’d discovered self-released albums I loved and it made sense that I could do the same and have a supportive group who would give me a chance. I definitely felt I needed to draw a line under those tracks but I’m proud of them – they lack some of the depth and (dare I say) sophistication of what I’ve done since but the core ideas and melodies are things I still really like. So following on from releasing your own stuff, why did you decide to set up the label? SH: Kris listened to Ethics Gradient and kindly purchased my debut. We got chatting through the Bandcamp app about the depth of talent on the DiS forums – I was listening to his track ‘New Racist Overlords’ from Post-Truth Politics for the first time in a while and it just stopped me in my tracks for its 15 minute duration. That was the spark; more people needed to hear music which was that good so I tentatively suggested we do something more formal. I had no idea what it was going to look like really but the idea got refined through a thread on the boards. I wasn’t anticipating running it necessarily, particularly as I knew nothing about what I was doing! KI: Yeah, that was a really interesting and fun process. Through lots of people throwing in ideas and voting on things we managed to come up with a label name, a strong visual aesthetic and develop this whole approach. SH: The artwork was an amazing community effort. I’m graphically defunct but fortunately we had great input from artists and supporters and kind of spiraled in on an aesthetic which I’m incredibly proud of. Even the name was crowd-sourced. KI: Steve and I have taken a bit more of an active leadership role since things have started moving but we still run the label as a democracy as much as possible. For example the artists all voted on how much we should sell things for and what the label share should be. It’s a hugely supportive environment; people share early drafts of tracks they’re working on and discuss techniques and approaches. It really feels like a collective of like-minded people making music simply because it’s a joy to make. Since the launch you’ve been releasing something every two weeks, will you be able to keep up that sort of momentum? SH: When we got to September last year it felt like we were at the end of the first ‘arc’ of Disintegration State. Kris, Jamie (Veins Full of Static) and I were taking a collective breath from mastering and promotional efforts. But we were still releasing fortnightly to the end of the year. It’s been the same again this year. I’m convinced it will slow down eventually. I think everyone’s in that sweet spot of learning lots really quickly and unlocking new ways of composing and generating new ideas. I’d love to keep to at least one a month in the long run. Mainly because that means lots of amazing music for me to listen to. KI: I’m genuinely astounded that it keeps on coming. I would not have anticipated we’d have hit 33 records in less than a year. SH: It feels silly to say this, but I feel like I have a different emotional connection to each album based on the artist’s background, my awareness of the creative processes, and where each sits in the label’s short history. Like hearing Colin Mawson’s Miniature Epiphanies for the first time was genuinely a bit emotional because he was such a big inspiration and seemed to validate everything we were doing. From a purely musical basis my favourite release is Lowering’s Collapsule. I love melodic IDM and he nailed it on that release. ‘Fexofenadine High’ and ‘Ergonomicon’ are just astonishing. KI: We’ve been pretty lucky so far in that there hasn’t been a single record that hasn’t that hasn’t blown me away. Veins Full of Static’s debut is one I’d pick as being up there for me. When I hear something and think “I wish I’d written that” – that’s when I know I’ve found something I really love, and Is All immediately had that impact on me. It’s tough to develop a unique voice in ambient music but he’s done it. Plus you’ve got people like Mute Branches and Henry Courgette also making completely unique stuff. They don’t sound like anyone but themselves. I find that genuinely remarkable. I honestly feel lucky that the artists just keep coming up with the goods. I get to master their stuff and be associated with it forever. That’s a real honour. There’s a really strong sense of collaboration from the label with your collaborative EP between you, Steve, and Colin Mawson and the tape release for Cassette Store Day where you all interpreted some half-finished tracks. Is that something you hope to do more of? SH: Absolutely. I’ve found I love working with other people’s music – it forces me in different directions to when I’m starting from scratch and that has then given me ideas for my own work. I’m really grateful Colin let me go to town on his delicate piano compositions – I got a taste for reworking tracks with the Cassette Store Day release and Colin’s work just felt so ripe for it. I’m a huge fan of all of Ryuichi Sakamoto’s collaborations with folks like Alva Noto and I’ve wanted to do something similar since my first proper foray into composing. I’m just not very good at piano melodies! On the subject of the tape, do you still think there’s a value to having physical releases in 2019? Does it add an unnecessary financial burden onto the label? KI: We’ve approached physical releases in a non-traditional way. The label compilations were paid for by contributions from the artists (a pay whatever you’re comfortable with approach) and then profits went immediately back to paying them off first and foremost. Individual artists pay for their own releases and the label doesn’t take any profit until they’ve broken even. Interestingly, the physical releases seem to have sold reasonably well. I think at this level when someone buys a physical release they do it almost as a symbol of their support as much as to have the thing itself. We’d love to expand into vinyl at some point, and we’ve had some interest from people, but that’s a much bigger financial burden to bear, so we need to be comfortable that we’ve got an audience first I think. The live night will be the first time a lot of you have played live. How did the idea for it come about? KI: There was some chat about putting a night on at some point, and then Gavin and Thomas from worriedaboutsatan got in touch with Steve and I to ask us to support them on the Leeds and London dates of their 2019 tour in March, and all of a sudden, there was a tangible reason to just get on and make it happen. SH: They’ve been really supportive of the label from very early on and it’s a huge honour to be performing with them. I’d been keen to play live for a while but wasn’t sure where to start so the live night was partly so we had a show under our belts before we rocked up to their gigs all bright-eyed and clueless. I’m really glad we had that catalyst of potential embarrassment to force us into pulling something together because I’m massively looking forward to it and just hugely proud of the talent we’re bringing to the stage. The whole idea behind the label was to bring exposure to amazing underground artists and this is exactly that. Personally, I’m feeling weirdly confident about my own set – it absolutely bangs! It’s been a lot of fun reworking the tracks into things I can perform live. I’m more worried about coordinating six artists and doing changeovers. I’d love to do more. We’ll definitely get a London date in this year, and I could imagine doing Glasgow, Cardiff, Cork is a must so we can play with MueseuM. Anywhere we have friends. KI: Also Stockholm to hang out with Body in the Thames in his studio and steal his synth collection! It’s gonna be great to meet the people who’ve been making this fantastic music that’s consumed our lives for the past 9 months or so. I’m fascinated to see how differently everyone will approach their performances too. I have a feeling Jacob Nico and Sunbane’s sets in particular will be intense affairs, but at very different ends of the spectrum. SH: Yes! I’ve only met Kris and Henry Courgette so far in person. I think Jacob is going to be awesome live. He brings something different and kinda visceral with his music. What do you have planned for this year? Do you have any ambitions for the label? KI: Interestingly, we’ve had this conversation a little already in the background. Whilst most of what we’re doing is still electronic of some persuasion, I’d like to think we’re developing a Disintegration State vibe as the catalogue expands. We’ve talked about the likes of Kranky and Sacred Bones being inspirations in terms of their willingness to embrace the music that feels right for them. And we already have a pretty wide range of records from techno to piano ballads to guitar drone. SH: I don’t think we feel confined to electronica/drone – Jacob Nico and some of Colin Mawson’s work sit quite far from what you might consider our bread and butter styles. Covering a wide range of genres while maintaining a strong aesthetic, that’s the dream. I’d love to get to a point like Shimmering Moods where we can consistently do small physical runs of releases without bankrupting ourselves. KI: Perhaps trickier is whether we expand outside of the Drowned in Sound forum. For the time being we’re keeping it DiS-focused because the generosity and support of that lovely community is what lead to all of this. But who knows in the future? SH: I guess one area we would like to improve on is diversity. We’re very white male right now. That’s a function of the folks who have come forward with music on the forums, but we need to work out how to be more representative. Maybe we will expand beyond those virtual walls at some point. We Are All Human by Steve Hadfield and Sleep in Perpetual Storm by Lowering are both out now. 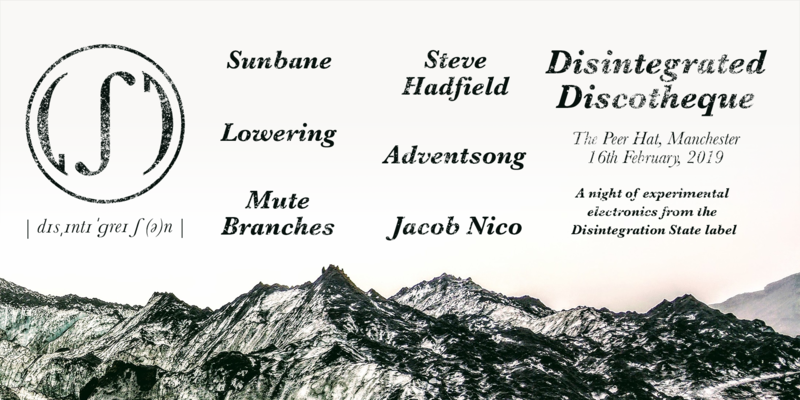 Disintegrated Discoteque is at the Peer Hat in Manchester on Saturday 16 February. Tickets are £6 from Songkick.